P5+1 to Offer Iran Another Bad Nuclear Deal? Comments by a US official suggest the P5+1 will propose another unserious deal to Iran today in Geneva. The U.S. and P5+1 appear to have prepared a bad deal to offer Iran this week as an initial agreement toward reaching a comprehensive solution to the dispute over Tehran’s nuclear program. Iran and the P5+1 will begin a two-day meeting in Geneva today that aims to resolve the over decade-long standoff over Iran’s nuclear program. Ahead of the meeting this week, both Iranian and U.S. officials have suggested that a first step deal could be reached at this meeting or in the near future. The purpose of the first-step deal would be to buy the Iranian and U.S. administrations more time to negotiate a comprehensive agreement by helping to stave off criticism from hardliners in both countries who oppose diplomacy. The seemingly coordinated public relations effort was encouraging in and of itself and seems part of a broader trend that has been evident since Hassan Rouhani’s election, in which Iranian and American officials are taking into account the domestic pressures the other side faces. The general positive atmosphere earlier in the week, however, seemed to be dampened on Wednesday during a background briefing American officials gave to journalists after arriving in Geneva where the talks will take place. The background briefing was given by a “Senior Administration Official” whose name was withheld from U.S. State Department transcripts. 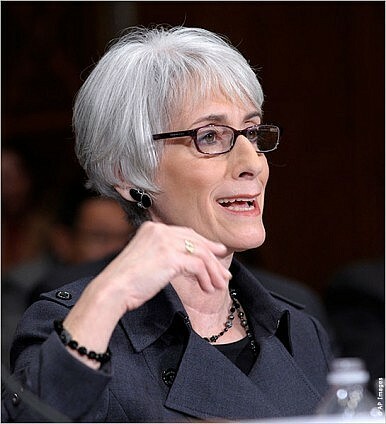 Nonetheless, the official basically identified herself as the lead U.S. nuclear negotiator, Wendy Sherman, through numerous comments she made during the briefing. Although the Senior Administration Official refused to give precise details on the first step deal the U.S. will offer Iran at the meeting today and tomorrow, what (s)he would say about it strongly suggested the deal would not be viewed positively by the Iranian side. If anything the comments could be stingier than the borderline offensive offer the P5+1 made to Iran earlier this year before Rouhani’s election, and in other rounds of negotiations in recent years. The official opened by saying that the U.S. is hoping to achieve “an initial understanding that stops Iran’s nuclear program from moving forward for the first time in decades, and that potentially rolls part of it back.” The purpose of this, as noted above, would be to “put time on the clock” for further negotiations aimed at finding a comprehensive solution. The administration is thus aiming to undercut the frequent criticism skeptics in the U.S. and allied countries make that Iran is simply using negotiations to stall for time as it advances its nuclear program. In other words, both sides offered minimal concessions in return for the other side agreeing to meet most of its major demands up front. Rozen reflected, “Western officials characterized the Iranian counter-offer as asking for a lot, and offering very little.” Iranian officials no doubt saw the same characteristics in the P5+1 proposal. Iran calls for global nuclear disarmament ahead of international negotiations over its nuclear program.